Once an oasis is completely explored, rating takes place. The influence stones all have different heights. The influence stones are lined up from high to low, in decreasing order. 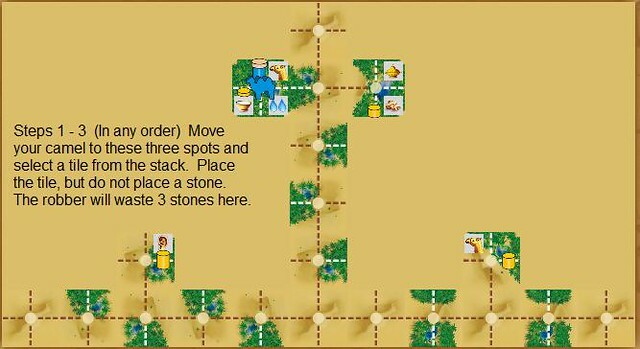 Following the order of the stones, you and the Robbers each choose one action per stone, in an alternating fashion. 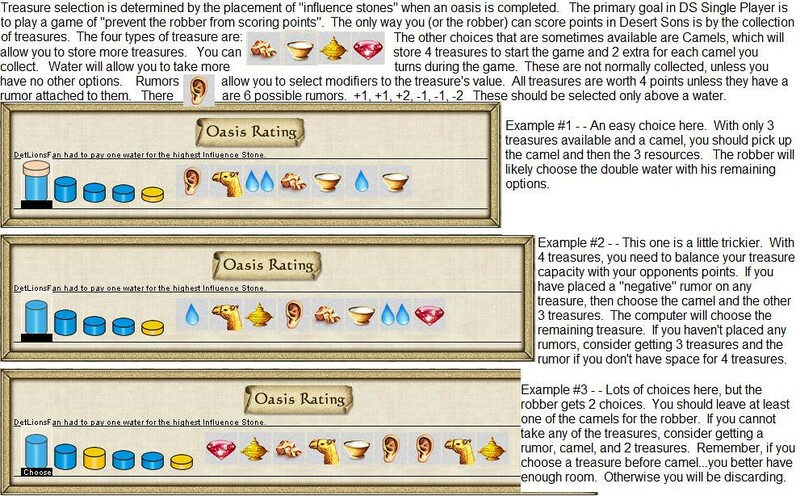 If more than 1 influence stone are set on an oasis and you have the highest stone, you have to pay one water. Each turn costs you one water. If you don't have water, the game is over. Now the value of your commodities is compared with the value of the Robbers' commodities. The difference between the two values determines the number of victory points you reached. We recommend that you use the tutorial option, at least during your first few games. The robber always knows which treasure has the best value and will choose that piece, if available. 1. Move one square down. Place the robber's 4-way piece first and a stone. 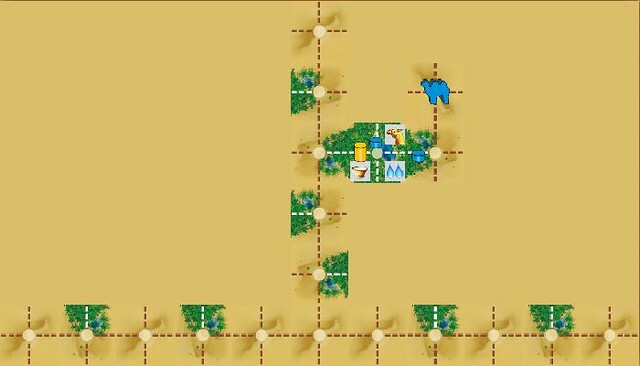 This will draw the robber's largest piece initially, which is the only piece he will continue to move throughout the game. 2. Move to the right and draw from the stack, place that piece down without a stone. 3. Stay on that spot and draw another piece. 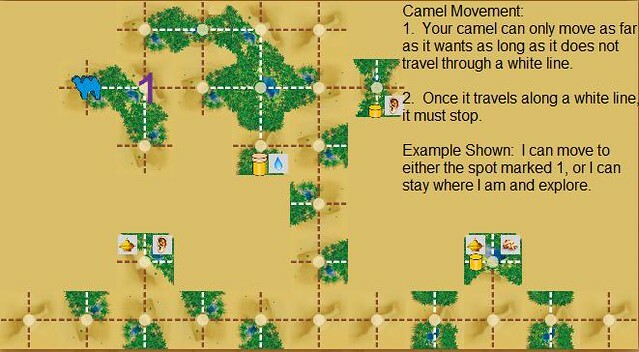 place it down so that the oasis is not complete. again, no stone. 4. Now move to the bottom-right spot shown below and trap his smallest stone. 1. If the piece has more than one treasure, the robber will place a piece. 2. 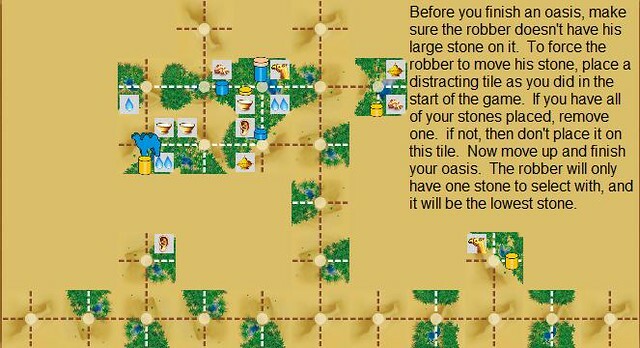 If you place a piece that has 1 treasure, the robber will place a stone only if you do not place a stone. 3. The robber will place pieces in the order from highest to lowest out of his available pieces. 4. If the robber has all 4 pieces placed on the board, he will move his highest piece instead of placing a piece. Check out the Power Point available at http://kbstuff.weebly.com/ to see a full game of 55 points. I start out by placing the opponents first two pieces as shown above. The 3rd piece usually gets placed on top. The goal here being to get the initial 4-sided piece closed off with as few tiles as possible. So if the 3rd piece drawn is a straight, gap, or 3-way piece, I would have placed it to the right. 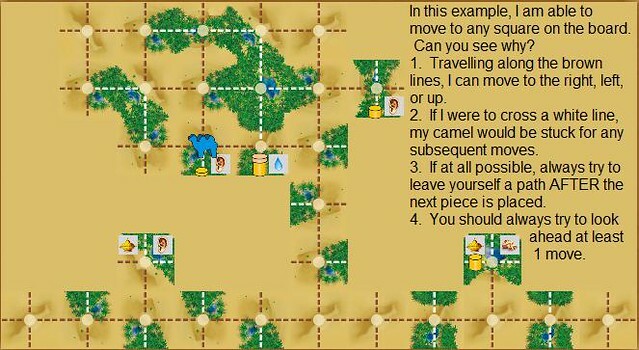 I still recommend starting off by trapping the opponents pieces prior to finishing your first oasis. Good Luck! I will try to answer your question and update the site with that answer.